Home » K2 » K2 2019 Coverage » 2018/19 Winter Climbs: K2 Climbers Enroute, Antarctic Update, 28 Everest Summits? 2018/19 Winter K2: Climbers Enroute, Controversy in Antarctic, Colorado Perfect 2018/19 Winter Climbs: K2 Climbers en route, Nanga Climbers Climbing, New Everest Route? 2018/19 Winter Climbs: K2 Climbers Enroute, Antarctic Update, 28 Everest Summits? The winter 8000-meter teams are all arriving or are already acclimating towards their objectives. 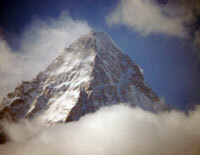 Remember this will be a long effort, especially on K2, with summits near the end of January at the earliest. The other K2 team is lead by Alex Txikon is now traveling by bus from Kathmandu to Islamabad while his Spanish teammates will fly from Madrid. He will be climbing with his long time friend and partner Felix Criado from Galicia, Spain and two additional teammates: Polish climbers Marek Klonowski and Paweł Dunaj. They will have a strong team of eight Sherpas with them in support including Nuri Sherpa, Chhepal Sherpa, Geljen Sherpa, Hallung Sherpa and Pasang Sherpa. Daniele Nardi with British Thomas Ballard and two Pakistani team members Rehmatullah Baig and Karim Hayat are attempting a new route on Nanga Parbat. They reached Camp 1 on the mountain while the two Pakistani mountaineers had hoped to move up to Camp 2 but heavy snow has forced everyone back down to base camp. American climber Lonnie Dupre, well known for his amazing attempts to summit Denali in true winter, left for Alaska yesterday for his winter attempt on nearby Mt. Hunter. Antartica expert and veteran polar guide Eric Philips added a bit more on American Colin O’Brady’s claim of a solo, unassisted, and unsupported 54-day Antarctic traverse. O’Brady pulled a 136Kg/300lb sledge from one coast to Antartica to the South Pole then to another costal point. The total journey was 1,487km/923 miles. He beat fellow racer, British Army Captain Lou Rudd by 2 days. Both extremely impressive. However, the record part of his journey has come under scrutiny given he traveled on the McMurdo-South Pole Highway, or the South Pole Overland Traverse Road (SPOT), a flattened trail groomed by tractors towing heavy sledges carrying personnel and supplies from McMurdo Station to the South Pole making travel on groomed ice vs the uneven and often impossible sastrugi (wind built ice formations) easier, and faster. To add further clarity to the discussion about Colin O’Brady’s claim on the first solo, unsupported and unassisted crossing of Antarctica, I have made up this map of solo crossings to date with some supporting narrative. Other factors also have a bearing on modern polar expeditioning such as the psychological benefit of satellite phones, accessible weather forecasting and sponsor obligations, and economic and logistic pressures that encourage people to choose routes that start and/or finish closer to logistics hubs. The terms unsupported and unassisted are no longer adequate in themselves so I have refrained from using them as labels. Kami Rita Sherpa at age 48 holds the record for most Everest summits at 22. He says he wants to continue climbing for the next 6 years. If he summits each year, that would put him at 28 Everest summits. source He used to work for foreign guide services but landed a lucrative contract with Seven Summits Treks to climb with them. And finally the young Sherpa who lost both set of fingers to frostbite while guiding a Pakistani client, Col Abdul Jabbar Bhatti , on Everest in spring 2017 has returned to Nepal. In an ironic move, he has agreed to take a job with the very company, Seven Summits Treks, that sent him in harms ways, very unprepared according to Sange Sherpa himself. Sange spent most of the last year undergoing reconstructive surgery by world-class doctors in Vail, Colorado due to the generosity of mostly US donors to cover his living and medical expenses and reportedly none from SST or Col Abdul Jabbar Bhatti. Best wishes in his new career.